The local bird community has gotten me using eBird. It's sort of social networking for birders -- you can report sightings, keep track of what birds you've seen where, and see what other people are seeing in your area. The only problem is the user interface for that last part. The data is all there, but asking a question like "Where in this county have people seen broad-tailed hummingbirds so far this spring?" is a lengthy process, involving clicking through many screens and typing the county name (not even a zip code -- you have to type the name). If you want some region smaller than the county, good luck. I found myself wanting that so often that I wrote an entry page for it. 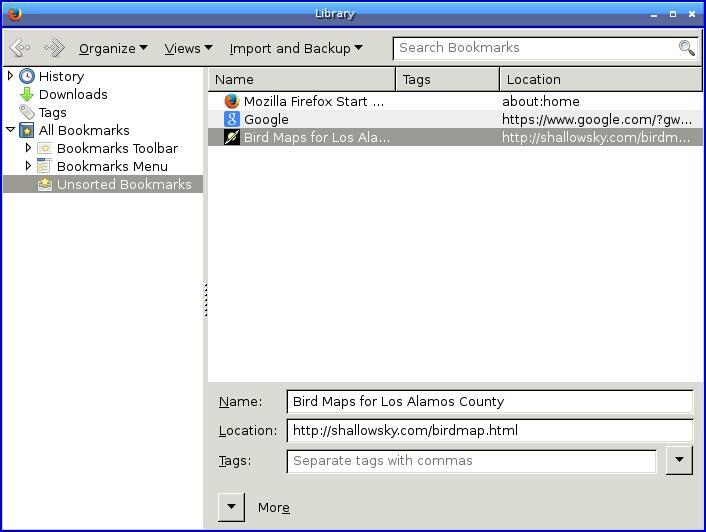 My Bird Maps page is meant to be used as a smart bookmark (also known as bookmarklets or keyword bookmarks), so you can type birdmap hummingbird or birdmap golden eagle in your location bar as a quick way of searching for a species. It reads the bird you've typed in, and looks through a list of species, and if there's only one bird that matches, it takes you straight to the eBird map to show you where people have reported the bird so far this year. If there's more than one match -- for instance, for birdmap hummingbird or birdmap sparrow -- it will show you a list of possible matches, and you can click on one to go to the map. I think all the major browsers offer smart bookmarks now, but I can only give details for Firefox. But here's a page about using them in Chrome. First, go to the birdmap page (or whatever page you want to smart-bookmark) and click on the * button that makes a bookmark. Then click on the = next to the *, and in the menu, choose Show all bookmarks. In the dialog that comes up, find the bookmark you just made (maybe in Unsorted bookmarks?) and click on it. Click the More button at the bottom of the dialog. Now you should see a Keyword entry under the Tags entry in the lower right of that dialog. Change the Location to http://shallowsky.com/birdmap.html?bird=%s. Then give it a Keyword of birdmap (or anything else you want to call it). birdmap common raven or birdmap sparrow and it will take you to my birdmap page. If the bird name specifies just one bird, like common raven, you'll go straight from there to the eBird map. If there are lots of possible matches, as with sparrow, you'll stay on the birdmap page so you can choose which sparrow you want. If you're not in Los Alamos, you probably want a way to set your own coordinates. Fortunately, you can; but first you have to get those coordinates. Note that all of the the "env." have been removed. The only catch is that I got my list of 4-letter eBird codes from an eBird page for New Mexico. I haven't found any way of getting the list for the entire US. So if you want a bird that doesn't occur in New Mexico, my page might not find it. If you like birdmap but want to use it in a different state, contact me and tell me which state you need, and I'll add those birds.